A few years ago, I came across a treasure trove of ancient information found in a sealed jar in 1945 near the town of Nag Hammadi about 75-80 miles north of Luxor on the banks of the River Nile in Egypt. They are known as the Nag Hammadi Library, texts or scriptures and thanks to them other major pieces in the puzzle were revealed and my already developing conclusions confirmed. 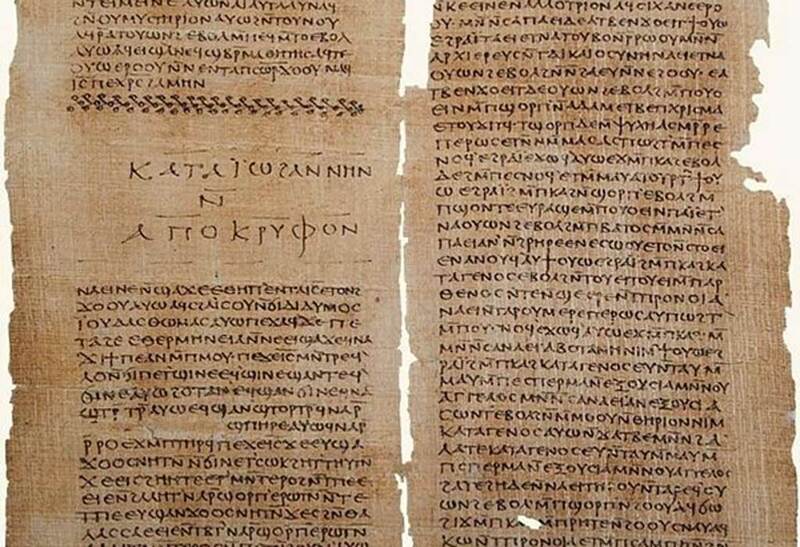 The Nag Hammadi find included 13 leatherbound papyrus codices (manuscripts) and more than 50 texts written in Coptic Egyptian which were the work – with other ancient influences – of a people known as Gnostics. They were not a racial group so much as a way of perceiving reality under the heading of Gnosticism. This comes from the term gnosis or knowledge in the context of spiritual knowledge and awareness of reality as it really is. Gnosis is a Greek word that translates as secret knowledge, and Gnostic means ‘learned’. We have the saying in English about ‘using your nous’ or using your head/brain/intelligence; but to Gnostics spiritual awakening or ‘salvation’ could only be attained by expanding awareness beyond what they called nous and into pneuma (Infinite Self). Humanity’s version of the intellect on which the whole crazy world is based is actually a shockingly low level of awareness which is lauded and feted as the fountain of knowledge. It’s more like a spout of ignorance. Gnostics were active in many locations and were targeted mercilessly by the Roman Church which felt severely threatened by the way the foundation of its own belief system was being turned on its head. What the Roman Church saw as its all-powerful God to be worshipped without question the Gnostics believed was the source of evil that created the material world – in my terms the ‘material’ world of the digital, holographic computer-like simulation. Gnostics could see through the illusion of ‘matter’ and I have no doubt they were helped in that understanding by the use of psychoactive potions that took them ‘out there’. Many insights about reality were inspired by such a haven of freethought thousands of years before science’ allegedly discovered them for the first time. This included the understanding that the Earth goes around the Sun 2,000 years before it was established by the Polish mathematician and astronomer, Nicolaus Copernicus. How so much more enlightened humanity would be had the Gnostics and other open-minded scholars been left unmolested to go about their quest for discovery. Alas, that was not to be. The unfettered, uncensored, free-thinking pursuit of knowledge was bound to twist the knickers of the Roman Church tyranny and in 415AD a mob of bewildered suckers led by Cyril, Patriarch of Alexandria, attacked and essentially destroyed the Royal Library as it had been before. Hypatia was hacked to death. The Library’s contents were lost in stages to a combination of fire and theft, and much of what was taken will be in the vaults of the Vatican to this day. Cyril was made a saint as with a long list of Roman Church mass murderers and crooks before and since. The attack that killed Hypatia fits with the estimated age of the Nag Hammadi manuscripts. They are believed to date from between 350-400AD although it is said they are likely to be copies of earlier Greek versions dating to perhaps 120-150AD or earlier. Centuries after the assault on the Gnostics of Alexandria came the campaign against the Gnostic Cathars in southern France which ended with them being burned at the stake after the siege of the Castle of Montségur in 1244. Gnostic information has always terrified the Church and for good reason, as we are about to see. It was believed that the details of Gnostic belief had been lost thanks to the efforts of Rome, but then Nag Hammadi changed the game. A major point about these documents is that because they were hidden for so long they have not been twisted and tampered with like their religious counterparts to suit the authorities of the ‘time’. What the writers believed, the texts still say. He is an incomprehensible one, but it is he who comprehends All. He receives them to himself. And nothing exists outside of him. But All exist within him. And he is boundary to them all, as he encloses them all, and they are all within him. It is he who is Father of the aeons, existing before them all. There is no place outside of him. The creations (extensions/emanations) of Infinite Awareness in awareness of itself can be symbolised as the manifestations of Thought, but I prefer the term ‘creative imagination’. This describes what the Gnostics called the Upper Aeons – the realm of Infinite Imagination and therefore All-Possibility, All-Potential. Gnostics symbolised Infinite Imagination as the ‘Father’ and ‘The Thought’ as the Mother. They said the interaction of the two produced a third force or imagined creation/extension/reflection of itself which was symbolised as the Son. For it is he who looks at himself [saw his reflection] in his light which surrounds him, namely the spring of the water of life. And it is he ... who gazes upon his image which he sees in the spring of the Spirit. It is he who puts his desire [intent] in his water-light which is in the spring of the pure light-water which surrounds him. And his thought performed a deed and she [the ‘Mother’] came forth, namely she who had appeared before him [his image/imagination] in the shine of his light. [She] came forth from his mind ... This is the first thought, his image. But the Father is perfect, knowing every space within him. If he wishes, he manifests whomever he wishes, by giving him form and giving him a name, and he gives a name to him, and brings it about that those come into existence. Upper Aeons are the realm of the ultimate ‘Creator’, or creative force/imagination, and it begs a question: If that is the case why is life so unpleasant – even shockingly bad – for so many in our reality? There is an answer to that. This article is an extract from the book ‘Everything You Need to Know but Have Never Been Told’ by David Icke. Visit www.davidicke.com for more information. Gnostics are the ones that know. What they knew is that the God of the Old Testament is actually the Devil herself. Just writing to inform you that Persia is contemporary Iran. That state is muslim, and hence against Rome (as per the apocalypse scenario of the Quoran, as I understand), and probably not much fond of Jews or Christians either. The artificial state of Israel is Jewish, and certainly not fond of Persia (rather hostile towards-, actually), of Christians, or indeed of anything non-Jewish. Rome is a concept that should either be defined in terms of a specific version of the Roman empire based on historical facts, or else it should be interpreted symbolically/methaphorically, in which case - for the present - it could even mean "the US/European western world". The "Holy Roman Church" is based in the Vatican State, in southern Europe (Italy). I do not know it's policies toward Muslims or Jews, but the "H.R. Church" is neither Jewish (they use Synagogues) nor Muslim (they use Mosques), it is Christian. Correction: "it could even mean "the US/European western world". " That should be " the US/European/middle-eastern western wold"
The middle eastern countries with their competing versions of Christianity/Islam/Jewdom are part of the fabric of the current western world, hence part of the methaphorical concept of "current Rome". There would be no western world without middle eastern oil, and there would be no christianity/jewdom or islam in Europe or US if it all had stayed at home, at its origin. Always inspiring to come in touch with such infos. Thanks very much David Icke and Ancient Origins for publishing this one. Re: "Upper Aeons are the realm of the ultimate ‘Creator’, or creative force/imagination, and it begs a question: If that is the case why is life so unpleasant – even shockingly bad – for so many in our reality? " Uhm... why do you suggest that there is a contradiction between who/what rules your so-called "Upper Aeons" (a theoretical construct/metaphor in some kind of alleged ages-old philosophical paper/script) and the contemporary (quality of) life in general? Or, even a relationship? This is not clear from the text above. Also, a question: Is this yet another christian/jewish/muslim sect? It is not clear to me from the text but the thoughts presented here do invite such an assumption, imho. That could be due to the article author mixing "middle east religion" concepts and gnostic concepts, or it could be due to the gnostics being yet another such middle eastern religion/philosophy - it is nor clear from the article.